A few months ago I got a request for a Halaal Trini Black Cake recipe. Those of you familiar with the permutations of the traditional Caribbean Christmas black cake (whether you call it black cake or great cake) will know that this cake is generally viewed as inextricable from its alcohol content. In fact, a visitor to this photo on Flickr felt compelled to tell me “the call it rum cake because theres some rum in it“. Grammar and spelling notwithstanding, I understood the sentiment although I had never called Mom’s Black Cake “Rum Cake” for obvious reasons…but maybe some people will think it’s sacriligeous to make this cake any other way than reeking of rum or other spirits That’s ok – I just won’t eat it that way. And this cake that Mom makes, which she agreed to share the secrets, is so rich, and moist that it is appreciated by rum cake lovers and Muslims alike. The traditional way of making Black Cake involves mincing and soaking the fruits from up to a year before baking. Soaking in alchohol. People pride themselves on getting the fruits together earlier than their neighbours so they get the right flavours and textures. No alcohol ergo no need for soaking. We’re not fermenting anything here. The cake is supposed to be moist, dense and dark. The fruits get the moistness into the cake and Mom’s secret, from her mother, is the addition of condensed milk, which maintains helps maintain the right texture. There are NO leavening agents used in the cake – the eggs will do the necessary – and bake on low heat. With plenty browning, the cake is supposed to be black, remember. The other notable difference between a regular Black Cake and the halaal version is the timing of its baking. We (my family) don’t celebrate Christmas, so we don’t make the cake for Christmas. (That’s not to say that there aren’t Muslims who might make it around Christmas time, just not us). Mom will make it for special occasions indeed (it is a rich cake) such as Eid, or to send with me to Guyana so I have a taste of home. In fact, we still have some cake that she baked for Eid ul Fitr a month ago, that stayed, just like the alcoholic version, in the cupboard, getting moister and lovelier by the day. Without further ado, onto the recipe. 1. Preheat oven to 300 degrees Fahrenheit. 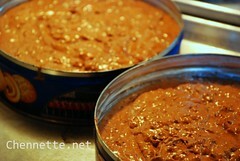 Grease cake tins with shortening and line with parchment or waxed paper – line bottom and sides. Mom likes to use the old Danish Butter Cookie tins, since they have covers for storage after baking. 2. Mince fruits in blender or food processor until as fine as you like it (I like it almost to a paste – I don’t like discernible bits of fruit). 1. Cream butter, shortening and sugar till fluffy. 2. Add eggs one at a time, beat well between additions. 3. Add fruits, mix well. 4. Add browning, condensed milk and cinnamon, mix well. 5. Add flour, about 2 ounces at a time, mix between each addition. At this point, Mom will put a tablespoon of the cake batter on a saucer into the microwave to cook. Taste this to test for sweetness and of course look at the colour. Determine if you need more condensed milk or browning, or if you are in a really humid place (more than here? whew) more flour. If you think it has too much flour, addition of a little condensed milk or more browning can help balance it out. 6. Pour the batter into the prepared cake pans. 7. Bake in the oven for about an hour – until a toothpick inserted into the centre comes out clean. Traditionally, the Black Cake is soaked in alcohol after baking and “topped” up ever so often, which keeps it edible and moist long after the normal shelf life of cake. Mom used to soak her cake in grape juice or apple juice to mimic this process and texture. However, this won’t keep the cake. You’ll have to store it in the fridge. However, this cake is naturally moist and it tastes better and moister after a few days. In fact, without soaking it stays moist and keeps out of the fridge for weeks. Mom currently has the cake from Eid (whatever’s left) in a container and it hasn’t been refrigerated yet. For safety, you could choose to refrigerate and then just bring to room temperature before eating (if you microwave it before eating it gets a little soft and the sweetness can be a bit over the top – but maybe you like that). This entry was written by Chennette and posted on October 7, 2010 at 9:00 am and filed under 'Id, Caribbean, food, recipes, Trinidad and Tobago. Bookmark the permalink. Follow any comments here with the RSS feed for this post. Post a comment or leave a trackback: Trackback URL. Well any cookie tin or sweet tins with covers woudl do. Perhaps the Mac Intosh toffee tins, they do have some big ones, a lot of toffee to eat though. *shakes head at that person’s comments*. Amazing the number of people who still think that kosher/halaal or even vegetarian recipe adaptations are instantly rendered invalid. hey my comment never went through? haven’t been checking Akismet! it’s been a couple years since I have had problems but of course it would choose to spam people I know! People in Trinidad got rich from oil and LNG so they bought cake tins on Charlotte street instead of using the superior Danish ones. I work with someone from Jamaica. I’ll have to make this and ask him if it tastes similar. Did you mom invent this cake? I have never heard of a non alcoholic black cake before. Wow seeing that batter in the butter cookie tin almost made me cry!!! Love the condensed milk ‘condense milk’ lol idea. My friend makes hers with grape juice instead of alco i need to try both versions i find regular black cake quite tasty but sometimes the alco is a bit ‘sharp’ on the tongue! I know of folks who use grape juice to presoak fruits just before baking , like a couple hours. Longer than that ferments the fruits in the grape juice . However the taste is different, like acidic, but some people like that taste. As a fellow Trini Muslim, I grew up on non-alcoholic black cake too. Except my Mom didn’t use condensed milk, but Welch’s grape juice. I think you could call it a fruit cake – it sounds like what is sold in Indian grocery stores as fruit cake (and English ones too I believe but I dont have experience of those)…allowing the fruit to soak for so long must make it super-delicious! Thanks for posting this. I once had a question about making the cake non-alcoholic and my suggestion was to soak the fruits in grape juice. This cakes looks dense and rich. I think soaking in grape or apple juice is an accepted and much-used method – this is just an alternative and the cake is really rich and tastes better a week later! Great recipe – thanks for sharing the tip about the condensed milk. Black was always reeking of rum when baked at our house so it’s refreshing to read an alternative version which I can still try out in time for Christmas! OMG! 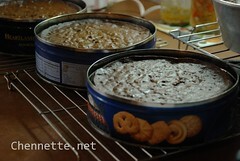 I thought my mom was the only one who baked her black cakes in Danish cookie tins. Liane – one of the beauties of this blog/post is seeing just how many people use these butter cookie tins Not just my mom or yours hoarding them for this purpose! I have a question. For how long should fruits be soaked in apple or grape juice ? Will 24 hours suffice ? Also should the soaking fruits be kept in the refrigerature ? Hi Mugdha – we don’t usually soak our fruits anymore, because when you mince them fine, they are nice and soft anyway. Plus the recipe is moist enough without the additional liquid. If you do want the fruit a little coarser/bigger then you could soak it a little, but only for half hour or so before you start making the cake, unless the fruits are dry…but you need to account for the additional liquid in the recipe. Another non-traditional alternative might be to let the fruits cook a little in the juice, maybe get some caramelly flavour from the sugars cooking/stewing before adding it to the cake…but I don’t make cakes regularly enough to try that yet! We actually used peardrax and malta to blend the fruits and it always turned out great. peardrax and malta actually sound like an excellent combination for this – some sparkling fruity taste and a rich malt taste. Interesting! So my recipe which was my secret has been shared with Chennette…..and with my permission has been posted here…..Perhaps because many persons commented on the moistness of the cake without alcohol. This non alcoholic version is exactly what I’m looking for. What exactly is browning though? Thanks. Hi Marie. Browning is caramelised sugar…it is sold in west Indian stores as browning or cake browning if you are in an area where this is available. It gives it the dark color for “black” cake. Essentially you heat sugar in a pot until it melts and turns brown, dark brown but before burning completely. Will look for someone who has an online explanation…I brown sugar for Pelau and stew chicken but for cake usually just buy it…. where is the rising agent in this cake – i did not read any baking powder in the recipe. Hi Gita…the rising comes from the eggs, there is no baking powder or baking soda. It is supposed to be a somewhat dense moist cake. Very different recipe , I would say!! I make both versions of the cake, one with rum and one without rum and any leavening agents, and it’s very moist and delicious, but I do not use condensed milk. In growing up my mom never used any alcohol in her black, at least not the ones they served to the kids. B the way, I love your blog!! Wow! My dad is from the Bahamas and since Eid is coming up I thought I would surprise him with a nice black cake since he loves them so much. I had found a recipe on the NY times and was just trying to figure out how to substitute the rum in the recipe. This onesounds great! I also read how someone put malta in theirs…got to try that too! Thanks for the recipe and Ramadhan mubarak! Reading about the non- alcoholic version, I have tasted it from my friend, she uses grape juice. My mom used Guinness stout to soak after baking, somehow here always tasted better than my version, it keeps the cake moist. A happy holiday to all and happy black making, I live in canada and I make black cake as gifts for Christmas and my Canadian friends looks fwd to this every year . Regarding that person’s comment, where I come from Rum Cake and Black Cake are two different things. Besides, why did they have to be so rude and ignorant? Not everyone can partake in alcohol, whether for religious purposes or medical reasons. I’m planning a holiday party this year for friends and family. In this mix we have Jews, Christians, and Muslims. I want to make a cake without alcohol for my Muslim friends so I am so happy that I came across your recipe. The pictures look just like our cake, so I can’t wait to try this. Thank you! I have never written a review for anything online, but felt compelled to this time. I remember searching for a halal black cake recipe and was overjoyed at finding this one. I baked this recipe without altering a thing and felt like I had one first prize. To bake a black cake now meant that I had finally suceeded in the Caribbean kitchen:) The cake tastes out of this world and was enjoyed by everyone (rum drinkers included). This is the third year I will be baking this cake for both Eids. Thank you and your mom! Yay! I like when the recipes work out. Mom will be happy too. Thanks and Eid Mubarak! What is “browning” for this cake recipe? Is it powder or liquid? Browning is a liquid sold in the Caribbean for cakes and stews. 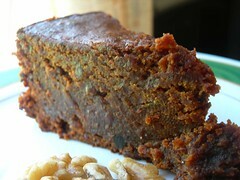 It may be found in West Indian groceries as well, either as browning ot cake browning. It is essentially sugar which has been caramelised to a dark liquid and thinned with water for storage. You can substitute some thinned molasses although the flavour will be different. Thank you sooooo much for posting this. I’ve been muslim for 7 years now and no one I know in UK will make a non alcohol version, so it’s been a while without my favourite cake. Now I’ve found this my children can taste a little of their culture. Assalamu ‘Alaikum Inaya! Glad to be of help 😉 Hope you enjoy it. I am so glad I found your page .. want to surprise my mom as I have no idea how to make/bake a guyanase black cake . Hope it looks as nice as your. Hi Sandra, and welcome. Glad the recipe worked out with the grape juice. This cake has no alcohol to preserve it, so I would not keep it out longer than a couple days, especially with the juice. Without the juice it can stay out a few days longer, but traditional black cake stays out of the fridge because it is well preserved by the alcohol. Lorraine, browning is just burnt sugar with very little water added at the very end. Put about 2 pounds of sugar (brown is best) in a pot on low flame and do not turn it but stay right there to see that it doesn’t burn. When sugar is about three quarter way burnt, put some water in a kettle to hot. You may use less than 1 cup but make sure you’ve more than less (I make a medium size bottle and keep in my pantry and I don’t measure anything). The sugar will start burning from the edges to the center of the pot. When sugar has almost done burnt it will starts to look kind of reddish and then it will starts to turn blackish; that’s the time to pour a little water into it and stir it very quickly then strain it (it should have the consistency of honey when it is completely cooled so do not put plenty water; remember hot water). I’ve never bought browning and I’ve been baking for the past 49 years. Ahhhh! My Aunt just threw away my Danish butter cookies tins!! And I just saw this recipe!!! NNOOOOOOOOO!!!!!! Where do I get Danish butter cookies this time of year????? AAAAARRGGGHHHHH! I wonder how this would be as a wedding cake? Chennette, thanks for this! Any idea how I would cook this in standard sized cupcake tins in terms of temperature and time to bake? Any thoughts? I have never made them as cupcakes, although Mom did do small cakes (she had I think a 6″ pan). And she used to microwave small amounts to test for the taste and texture before Baking the full cake. But the required temperature is reasonably low, so I would keep it at 300 F and check it after 20 minutes to gauge doneness. Since it is not a sponge or meringue you won’t do it any harm by checking every 5 minutes after that. Hi…I’m so glad I found this……my dad loves fruit cake but he’s on a bunch of medication and I don’t think alcohol in any form is a good idea for him. Other than grape juice, what specific non alcoholic red wine would you recommend using? Sorry I am only now replying to this. I don’t actually use any of the non alcoholic wines, and don’t always use even juice in the cake so can’t help re red wine.